Motorola Solutions is a leading provider of mission-critical communication solutions and services for today’s Manufacturing companies. From the production line to the loading dock, in the front office or off-site, Motorola Solutions is helping manufacturers work more efficiently, productively and safely in the most demanding environments. Manufacturers worldwide are transforming their workplace with Motorola’s integrated manufacturing platform and expertly integrated systems, applications, accessories, and services. MOTOTRBO™ radios connect different teams, departments, and machines together to keep operations running smoothly and keep manufacturers competitive at the speed of business today. Through leading-edge innovation and communications technology, it is a global leader that enables its customers to be their best in the moments that matter. 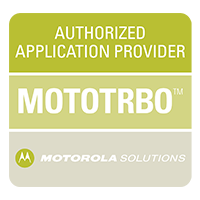 SeQent and Motorola Solutions have a strategic partnership that is focused on the manufacturing industry. SeQent is part of the two-way radio Application Development Partner (ADP) Program and is the top partner for the industrial manufacturing space. Manufacturers need access to real-time information from multiple industrial systems and SeQent delivers this information via text message to the MOTOTRBO™ and WAVE Work Group Communications platform.